Of all the guitar apps available on the App Store, Frontier Design’s iShred: Guitar + Effects is my favorite. Besides providing a virtual fret board where you play chords and individual notes, the app also features an amp simulator and a plethora of pedals, such as Fuzz, Wah, and Chorus. 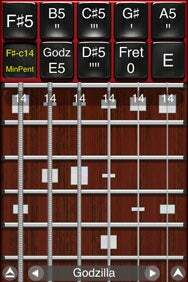 Rock On: Arrange chords and scales on your virtual guitar fretboard and play real music with iShred: Guitar + Effects. Fair warning: This app is not for anyone with a short attention span. There are lots of options available, so the learning curve is higher than some of the other guitar apps out there. This is actually an advantage because it allows practiced users to produce what could be considered “real” music. You can record the songs you create, play along to songs on your iPhone or iPod touch, and you can even share your songs with other iShred users via a service called AirPlay. Some sample songs are included with the app and the developer’s Web site is a great resource for video tutorials and examples. So, this is a terrific app, as long as you’re willing to put in the time and effort to learn your way around it. Just make sure you have enough time in your day because, if you like to make music, you can easily get lost in iShred for hours at a time. iShred: Guitar + Effects is compatible with any iPhone or iPod touch running the iPhone 2.x software update.